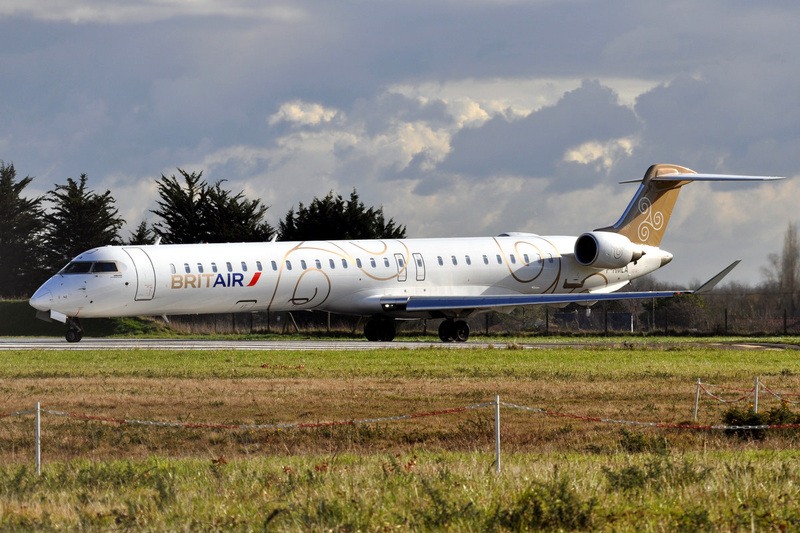 Brit Air, a regional airline owned by Air France, was one of the original Bombarider CRJ1000 NextGen operators. On December 14, 2010 Brit Air took delivery of one of the first 2 CRJ1000 NextGen jets. In March 2013 Air France merged Brit Air and it's two to other regional airlines to form HOP!, Air France's new regional carrier. More on the Air France Bombardier CRJ1000 HOP! operation can be found out on our Bombardier CRJ1000 Air France HOP! Page. All of Brit Air's CRJ1000 operations are apart of HOP!. The Brit Air Bombardier CRJ1000 NextGen was configured with 100 seats in an economy class configuration and is still configured the same with HOP! As of June 30, 2013, Brit Air was listed on Bombardier's Program Status Report - CRJ Series to have ordered 14 CRJ1000 regional jets, with 13 delivered, leaving 1 Brit Air CRJ1000 jet on backlog. These CRJ1000 jets will be in operation with HOP! Above Brit Air Bombardier CRJ1000 NextGen page photo by Olivier CABARET on Flickr. Photo released under a Creative Commons License. Here are the following naming variations for the commercial regional jet: The Bombardier CRJ1000 Brit Air is also called the Bombardier CRJ1000 NextGen Brit Air, Bombardier CL-600-2E25 Brit Air, Canadair CL-600-2E25 Brit Air, Bombardier CRJX Brit Air, Bombardier CRK Brit Air, Canadair Regional Jet 1000 Brit Air or the Bombardier CRJ 1000 Brit Air / CRJ-1000 Brit Air (with a space or a dash) due to the various names for the jet aircraft.